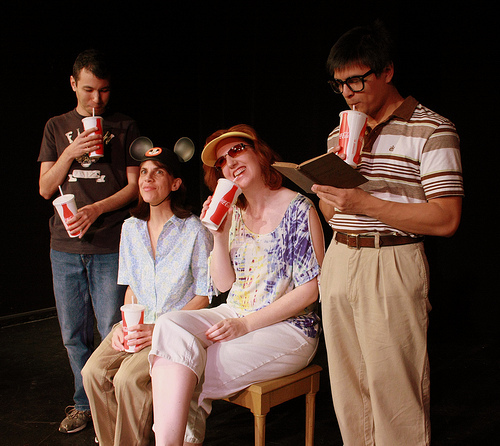 Dragon Productions’ current show, “Marvin’s Room”, is vaguely reminiscent of that famed late 1970s soap opera parody “Mary Hartman, Mary Hartman”. The story reads like a soapy satire, particularly in Act 1, though it’s not quite as bizarre as the aforementioned show. Playwright Scott McPherson uses dark humor in his unconventional story to address life issues of family estrangement, impending death, and serious physical and mental illness, maintaining that it’s important for audiences to know it’s acceptable for them to laugh at the situations brought out during the performance, even in the midst of pathos. The primary story is set in Florida. Marvin, the heard-but-not-seen title character, is the family patriarch bedridden and dying for the past 20 years, a victim of both stroke and cancer and cared for by his eldest daughter, Bessie. The selfless Bessie also looks after her 70-year-old Aunt Ruth who’s partially paralyzed, slightly demented, and fitted with an unusual pain cure. Starting with a trip to the doctor’s office for fatigue, Bessie is treated by Dr. Wally, an inept, dimwit of a doctor who can’t keep her name straight and insists on running some tests. Not quite as obtuse as he appears, he informs Bessie that she has Leukemia and needs a bone marrow transplant. For that, she’s told a close relative is her best bet for a match. Bessie’s younger sister Lee and Lee’s two boys Hank and Charlie live in Ohio, but there’s a complication. Hank is a patient in a psychiatric hospital, committed there after burning their house down. Lee and Bessie have been estranged for many years, and Bessie and the boys have never met, so it’s a tad awkward as Bessie reaches out to Lee to see if she or her sons are possible donors. Lee and the boys travel to Florida where the deeper family drama ensues. Other minor characters include, Bob, Dr. Wally’s heavily medicated brother who’s his office assistant and is really a throw-away character used to lighten the office mood; Dr. Charlotte, Hank’s psychiatrist at the hospital in Ohio; and a retirement home director in Florida. Director Laura Jane Bailey has staged an interesting production, utilizing her cast not only as actors, but as extra stage hands to help the crew manipulate the flexible three-paneled rolling wall forming the basis of Neil Ormond’s reconfigurable set, but more on that later. The standout performance belongs to Mary Lou Torre as Bessie. Although her facial expressions favor an eye-popping display of dismay each time she’s dealt an emotional blow particularly as a scene ends, her demeanor and delivery are mostly believable. Her chemistry with all of her castmates is strong though her scenes with Jeff Swan’s Dr. Wally are particularly funny as they spar over office shortcomings, tests, and the test results. Ronald Feichtmeir’s Hank shows a great deal of growth, starting out petulant and defiant, determined not to cooperate with anyone, and resentful of being dragged to Florida to help his Aunt Bessie who he previously didn’t know existed. Feichtmeir captures the troubled adolescent well, not making eye contact, and always in motion. As his character develops and grows to understand what it means to give of himself even without the promise of a reward, he calms down and becomes softer. Feichtmeir and Torre have some especially nice scenes together at the end of Act 1, and later in Act 2 as Bessie sees through Hank’s blarney, and they level with one another. Meredith Hagedorn’s Lee is interesting. Lee has led a difficult life, and Hagedorn brings that out. Her interaction with Feichtmeir is believable as the overbearing mother, raising her voice and moving abruptly showing that Lee is trying to remain in control, but she’s on the verge of losing it. Her discussions with Bessie are heartfelt as the sisters reacquaint themselves, and learn some long held secrets previously hidden from one another. Clifford Samoranos is Charlie. He is mostly a caricature of a shy, conflict avoidant adolescent when he’s first introduced; moving in a jerky manner as he unnaturally raises his book to hide behind. He later opens up as his character becomes more comfortable and he helps Aunt Ruth in getting around. Lynda Marcum plays an appropriately scattered Ruth, but while the script suggests that she is supposed to be hunched over and partially paralyzed, she isn’t which doesn’t seem to fit the character. While her erect posture is opposite to what’s written, her shuffling gait hints at Ruth’s physical infirmity. She also reads quite a bit younger than Ruth’s scripted age of 70. Jim Johnson and Janine Evans round out the cast as the other minor rotating characters and provide additional hands for handing props and set changes. As mentioned earlier, Ormond’s hinged, three-paneled wall is reconfigurable. It’s folded differently for each of the locations with two or three of the panels visible when it’s transformed with changes in paintings, visible windows, and furnishings effectively distinguishing each locale. As each scene ends, various cast members help the stage crew smoothly roll the connected walls into position for the next scene. Steve Shumway’s lighting design works, but in the intimate Dragon performance space with such sweeping moves of the set, the changes from scene lighting, to dim set change lighting, to blackout, to new scene lights up are abrupt and slightly disturbing. Sound designer Jeffrey Lo’s choice of folk-rock music covering the scene changes enhances the pseudo-soap opera mood. Being live theatre, there were a few opening night mishaps. Along with a few line misses from various cast members which should smooth out as the run continues, Torre’s wig wasn’t behaving and fell off a couple of times. Quirky and irreverent, “Marvin’s Room” is worth a look. Because of the serious subject matter and some adult language, it’s not appropriate for young children. The show continues Thursdays-Sundays through 12 February 2012 at the 42-seat Dragon Theatre located at 535 Alma Street, Palo Alto, CA 94301. See http://www.dragonproductions.net or call 650-493-2006 for more information.